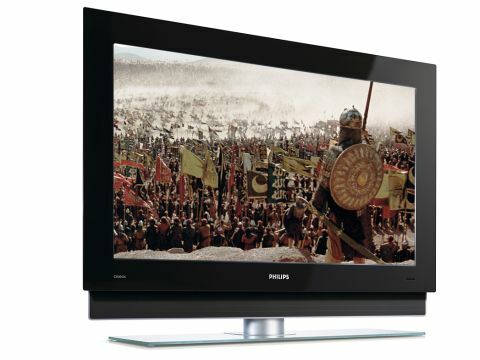 The strengths and weaknesses of LCDs and plasmas have won followings to both camps. If either wins out it will be in making TVs that buck the trend. This expensive £1,800 model might just do that. By shoehorning its ClearLCD technology into this 32in model it can theoretically reduce light output by 30 per cent more than the LCD norm and aid black performance. It also improves motion handling with what it calls Overdrive Control and Dimmable Scanning Backlight. The first is designed to boost the voltage applied to the screen to quicken its reaction time while the latter allows the pixels to be lit for shorter times. Elsewhere the TV scores well. It offers a 1366 x 768 HD resolution with a claimed brightness of 550cd/m2 and contrast of 7000:1. It's capable of handling 480p, 576p and 720p. Sockets include two HDMIs, three Scarts (2 RGBs), two USBs and a D-Sub PC input, a multiformat card reader, Ethernet port, CAM slot and all the analogue variations. Aside from the contentious virtues of Ambilight (it emits coloured light in tune with the TV's pictures), Pixel Plus 3 HD image controls the degree of noise reduction and helps keep images sharp, without the noise. ClearLCD also cleaned up a lot of smearing on horizontal motion though it made the picture look a little unfocused. The standard-def pictures were among the best we've seen on this size of LCD and these are most of the pictures we'll be seeing for a while. But happily, hi-def images also came out looking unprocessed and natural to the point that the implausible plot of Kingdom of Heaven made a kind of seamless sense. Colours displayed a wide palette without looking gaudy. Sonically, it was competent with a wide frequency range and clear vocals.